Every event is inspired by you and with you to create a memorable experience of flavors and feelings. You are unique and your food should be too. Lickskillet's master plan is to bring people and communities together through awesome food. We personalize our catering events with a specialty of weddings, private dinners and upscale small events. We emphasize on making a unique, personal experience that you will remember. Every menu is customized for your event, hence why there are only sample menus on our website. 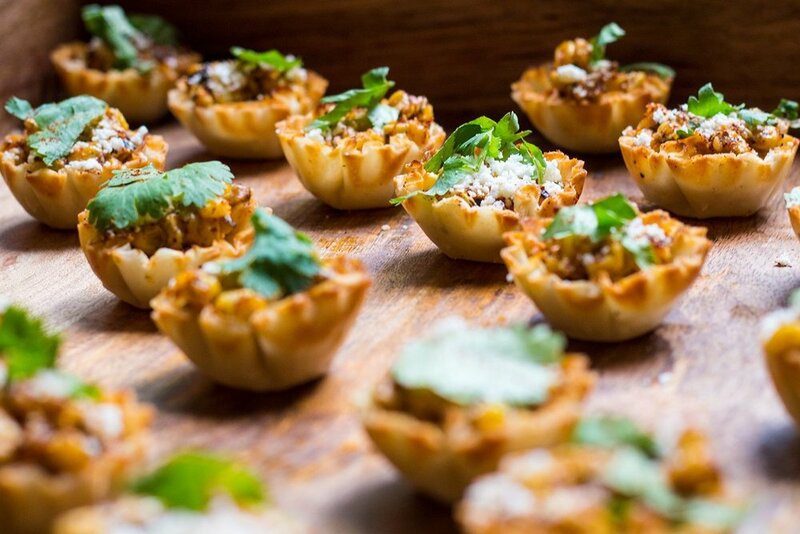 We prefer to drum up new ideas and flavors the reflect your style and way of operating - pushing forward to pair unique flavors for your event. Lickskillet can also offer a more casual food truck (Corndoggies) which launched in the spring of 2016. These corndogs are made from scratch -- by grinding the meat, linking them and smoking varietal sausages. They are then battered, fried, and paired with sauces that enhance the flavor of the dog. Look us up on Facebook or Corndoggies.com for more info on the truck. We look forward to creating good eats in the community, so keep an eye out and let us know what you think. Thanks for the support! Reaching from his New York, Midwest, and Colorado culinary roots, John will meet with you and create a menu that suits your personality, style, and financial resources. Why not do meat, potatoes, and green beans for every event? Because you are unique, and the food for your event should be an extension of you - so go for it! Jake has been with us since the very beginning of our business and has spent many hours mulling over ideas and creative ways to express emotion through our food. He is a dedicated soul with a complete love of food. A true food nerd, Rachel loves to dig into the books and put creative spins on classic cuisines. Originally from New York, her palate has been trained from an early age and she has backgrounds in butchery, cheese-making, fresh pastas and farm to table cooking. Lickskillet Road just may be the steepest dirt road in all of Boulder county -- with its one mile, 754ft climb, and 18.2% grade at its steepest part. Destined to be a restaurant name, we salvaged the abandoned road sign that was tossed across the creek while cycling up to the town of Ward. Our future food business was born, Licksillet. Making a name is the first step in creating a personalized catering for you and all your guests to enjoy. So please ... do enjoy!